Now when the apostles at Jerusalem heard that Samaria had received the word of God, they sent to them Peter and John, who came down and prayed for them that they might receive the Holy Spirit; for it had not yet fallen on any of them, but they had only been baptized in the name of the Lord. Then they laid their hands on them and they received the Holy Spirit. Confirmation perfects Baptismal grace; it is the sacrament which gives the Holy Spirit in order to root us more deeply in the divine, incorporate us more firmly in Christ, strengthen our bond with the Church, associate us more closely with her mission, and help us bear witness to the Christian faith in words accompanied by deeds. Children are eligible for the Sacrament of Confirmation when they are in the eighth grade and, again, must have a baptismal certificate on file with the Faith Formation office. Specific preparation begins in the seventh grade and children must be registered in a Catholic School, Faith Formation classes, and/or be taught at home with the guidance of the Faith Formation office. Regular attendance at classes is expected. 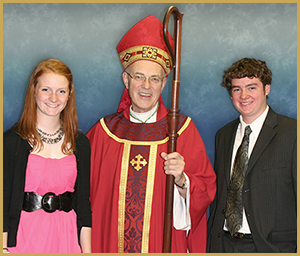 Confirmation is usually in the spring but depends entirely on the schedule of the Bishops of the Archdiocese of Detroit. Preparation requirements include: choosing a “Confirmation Name” and sponsor, and submitting a report on the chosen Saint; making a one day Confirmation retreat; performing the requisite amount of Christian service work; attending practices; and receiving permission to be Confirmed through an interview with either the pastor or deacon. Parents must be equally committed to assisting the children in achieving their goals through reinforcement at home, continuing attendance at weekly Mass, and attending sacramental meetings for parents. For various reasons, some Catholic youth missed making their First Communion in the second grade and some adults missed receiving the sacrament of Confirmation in their youth. In either case, please contact the parish office for more information on how to receive these sacraments.